Product prices and availability are accurate as of 2019-04-24 04:02:17 UTC and are subject to change. Any price and availability information displayed on http://www.amazon.co.uk/ at the time of purchase will apply to the purchase of this product. JJRC H47, an ultrathin foldable selfie drone with only 0.95cm thickness. The foldable arms will automatically pop out with only one press. The 720P camera and WIFI real-time transmission FPV system allows you to take high resolution pictures & video during flight. Also, altitude hold mode, beauty mode, one key return,3D flips will bring you tons of fun. This is the thinnest drone in 2017. With 0.95cm Ultra-thin body and auto-folding arms (Press the buttons at the each side of the aircraft to automatically unfold the crankshafts. ), it is the best choice for traveling. 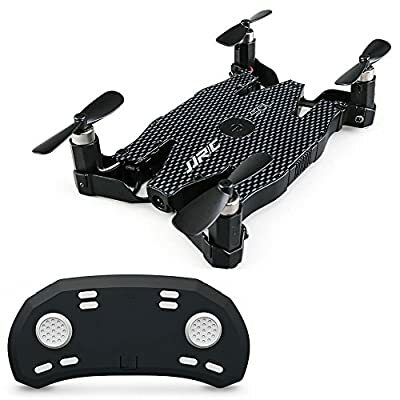 WIFI FPV With HD 720P Camera: 720P camera with Wifi real-time transmission FPV system, allows you to take high resolution pictures & video during flight. Altitude Hold Mode: In altitude hold mode, the aircraft maintains a consistent altitude while allowing roll, pitch, and yaw to be controlled normally. Headless Mode: Headless mode ensures that the quadcopter will always follow controls from your perspective all the time, regardless of which way the quad is facing. Beauty Mode: The beauty mode helps you beautify and retouch photos before shots at one tap. One key to return function makes it easily to find the way home.